The following set of pages is my Guide to Scoring Baseball. It shows the scoring method I use with my detailed scorecards, freely available at this site. After going through the pages listed below you should be able to score any baseball game you watch, or hear on the radio. It builds on itself, so you should go through the pages inning by inning, in order. The Guide details all the action for the historic September 8, 1998 game between the St. Louis Cardinals and Chicago Cubs. The game was broadcast on Fox television, and the original scorecard I made was from this broadcast. Any errors on my scorecard are, of course, my own. At the end, I'll give the scoring for some of the plays that didn't happen in this game, and provide a summary section showing individual plays and how they're scored. This should be a good reference after you've been scoring for awhile. The scoring for a single game cannot possible demonstrate all the possible plays, odd rules, or strategies of baseball, but this Guide should equip you to decide on your own how you wish to score the particular play in question. There are no hard and fast rules about how you score your own games, and even the official scorer for each major league team is likely to use a different method than the method shown here. There are a few things you should keep in mind, however. First, scorecards should allow the reader to replay the entire game, and all the action that took place. Second, you should be able to construct a box score from the information recorded. Finally, your notations should be clear enough that anyone familiar with scoring and the rules of baseball could obtain the information in the first two points. Ramzel, Carter and Lee Tunnell. 1994. Keeping Score, A Baseball Handbook. Austin-Greystone Press, Round Rock, Texas. 106 pages. -- A guide to scoring, much like these web pages except the game being scored is fictional and so contains a lot more of the unique plays that can happen in a baseball game. Hernandez, Keith and Mike Bryan. 1994. Pure Baseball. HarperPerennial, New York, New York. 259 pages. -- A complete, pitch by pitch analysis of two baseball games by former New York Met Keith Hernandez. While not technically about scoring baseball, the book contains completed scorecards for the games being discussed and you can learn a lot about scoring, strategy, and why scoring baseball is useful from this book. My scorecards are based on the scorecards in the back of this book. Dickson, Paul. 1996. The Joy of Keeping Score. Walker and Company, New York, New York. 117 pages. -- This book deals with how scoring has influenced and enhanced the game of baseball. It contains a lot of information about the different scoring styles, and has photographs of many many scorecards from famous games. An excellent book, although by itself it won't teach you how to score baseball. Wirkmaa, Andres. 2003. 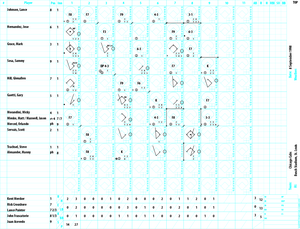 Baseball Scorekeeping: A Practical Guide to the Rules. Macfarland and Company. 278 pages. -- I haven't actually seen this book, but it was recommended to me by John Simonson. He writes: "It is an excellent explanation of the rules and decisions one needs to make when scoring. Nothing really about how to fill out a scorecard. It is a nice compliment to your tutorial." Bakalar, Nick. 1996. The Baseball Fan's Companion. Macmillan Company, New York, New York. 210 pages. -- An all around baseball book that covers all aspects of the game, including scoring. The scoring section is very brief, but since a large part of scoring involves knowledge of the rules, this book helps. Koppett, Leonard. 1991. The New Thinking Fan's Guide to Baseball. Fireside Books, New York, New York. 381 pages. -- This is my favorite all around book on how baseball works and the strategies involved. There isn't any scoring information in here, but I can't mention baseball books without mentioning this one. Major League Baseball. 2005. Official Major League Baseball Rules Book, 2005 Edition. Sporting News. 104 pages. -- The official rule book. Surprisingly easy to read and understand. A necessity for a serious baseball fan or scorer. The same information is also available at the Major League Baseball web site, but it's handy to have a version you can carry to the ballpark. Ready to start scoring baseball? Click on the First Inning link below to start the Tutorial.